How much money should I save? I get asked this question all the time. The simple answer is as much as you can. Seriously, every 1% you save will have a huge impact on your future net-worth. In fact, just increasing your savings rate by 1% could help you retire up to 2 years earlier due to the impact of compounding. 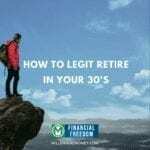 My simple recommendation for anyone in their 20’s or early 30’s is at least 25% of your income, but I know that’s not easy, or even possible for some people. But you can probably save a lot more than you realize. Over the past few months, many of the articles about me focused on how I saved 40-50% of my income on my journey to $1 million. Many readers, commenters, and even Michelle Singletary of The Washington Post thought escalating my savings rate from 15% to 40% was aggressive and not possible for most people. Sure, it’s tough to save money but I think the biggest reason people don’t save more is because unfortunately in popular culture “saving money” is portrayed as a sacrifice. As long as you, or anyone else, is viewing saving as a sacrifice, you aren’t going to save much money. Saving shouldn’t be an afterthought. You shouldn’t save the money that’s left over because there probably won’t be much. Most people spend every dime or even more than they make. You should always save money first – 5%, 10%, 20%+ of your income, as much as you. And then spend what you have left. This accomplishes a number of things. First, you save more. Second, you can spend the rest of the money after without feeling guilty. After you know that you’ve saved 25% of your income this month, you’ll feel great, and not worry about spending the rest of the money you made. Just that simple switch makes all the difference. When you save money, you are not only paying yourself first, you’re guaranteeing you will have money in the future. Then if you invest intelligently, you will guarantee you have even more money in the future. In my case, ever dollar I invested in 2010 when I started, is not worth $3.25. My investments have tripled and all it took was a few clicks on my phone. Saving money is hard at first but gets A LOT easier over time. Trust me, once you start saving more money you get used to it and won’t miss the money. But, the key to saving more money is to start slowly and escalate over time. This is why I developed the $50 a day early retirement strategy for myself. After saving daily for 3 weeks it will become a habit. It’s super easy to hack your brain – just keep repeating something daily and after 3-4 weeks you’ll want to do it. Here’s another take on how much money you need to save from the podcast. Sure, there are some people who simply don’t make enough money to save because everything they make is going to food, housing, childcare expenses, insurance, and other living expenses. But these are a lot of the same people I see driving around in new cars with $50,000+ car loans. If you are making $20,000 or less per year then it’s going to be very hard to get ahead, but you definitely can. You just need to start small and try to escape living paycheck to paycheck. It can take a very long time to save up enough money, but even $5 a day adds up to $1,825 per year. Almost anyone can save $5 per day if they really focus on it. I found $5 on the ground yesterday, flipped out, and then invested it immediately via my phone. If you invest just $5 a day for 5 years you will have $9,125! 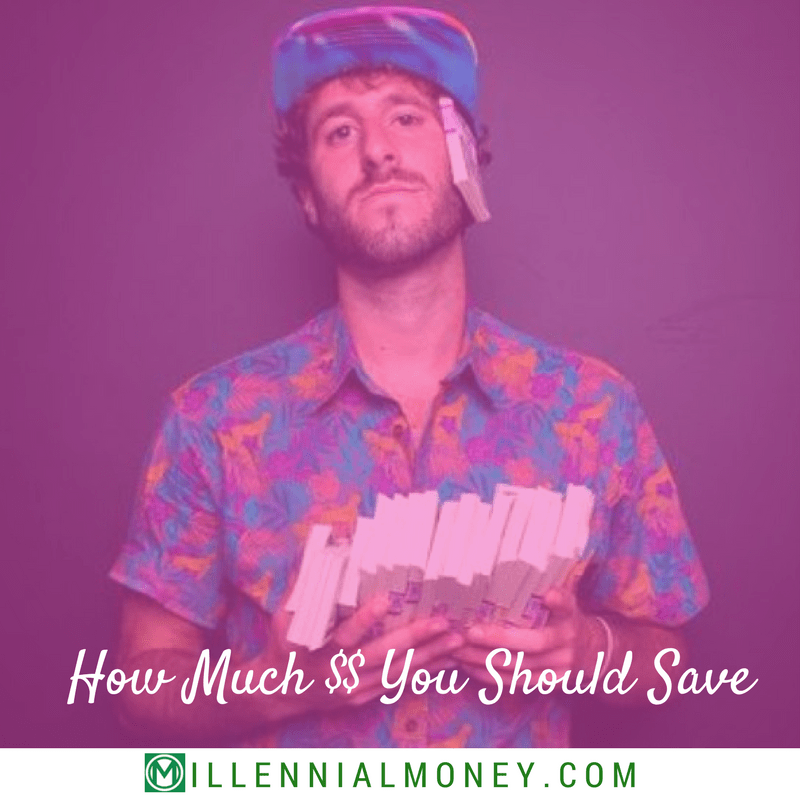 According to the US Census bureau, the average annual salary in the United States for a millennial is $35,000, which is not a lot to live on depending on where you live in the country, but it’s definitely enough to save $5, $10, or even $20 a day. Don’t get ahead of yourself. Just save something small every day. For someone making $35,000 a year, saving $5 per day is only 5% of your income. For anyone making $35,000 a year, saving $5 per day is only 5% of your income. The average American spends almost $800 per year on lottery tickets and people who make $20,000 or less spend an average of 10% of their income on the lottery. That’s the $5 a day right there. 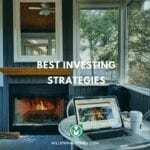 If you just save $5 per day and invest it in a Vanguard Total Stock Market Index Fund with an expected 7% annual compound rate of return, you will have $10,840 in 5 years, $77,263 in 10 years, and $177,082 in 30 years. All from 5 dollars a day. It’s tough to get ahead by just being frugal, cutting out all of the extra in your life will make you happier. Way too many of us just have too much stuff, buy too much stuff, or live beyond our means. Cutting back is all about balance and finding areas of your life where you can save money and start investing in yourself. One of the biggest ways I personally cut back was by downsizing my home when I went from a $1,500 a month apartment to an $800 per month apartment. Sure it was smaller, but I decided that the $700 a month that I would save, invested, was a better use of the money. I paid myself first. I made that decision in 2011 and every $700 I invested then is worth $2,500 today. Since I did it for a full year, the money I saved and invested by downsizing is worth $27,000 today. That’s a lot of money for just moving to a smaller apartment. Making more money is more important than cutting back or being frugal. It will help you get ahead a lot faster, especially if you invest all of the new money you make. There are literally an infinite number of ways to make more money, but the two easiest are to start a side hustle and get a raise. Every salary raise has an impact on your future income potential, so even a $2,000 or $5,000 can have a huge impact over the life of your career. But what’s even better – investing 100% of all of your salary raises, bonuses, or any extra income you make. If you can keep living on your current salary as long as possible and invest the difference you will come out way ahead. Sure investing 100% might be extreme, so try 50% or 75%. When you get a raise, talk to your HR department and tell them you want to increase your 401k contribution by contributing 50%, 75%, or even 100% of your recent salary bump. For any bonus you get, set aside 10-20% to spend on whatever you want, and invest the rest. If you can keep living on your current salary as long as possible and invest the difference you will come out way ahead. Sure investing 100% might be extreme, so try 50% or 75%. When you get a raise, talk to your HR department and tell them you want to increase your 401k contribution by contributing 50%, 75%, or even 100% of your recent salary bump. For any bonus, set aside 10-20% to spend on whatever you want, and invest the rest. Thanks for an awesome post! The mindset shift to think of savings as an opportunity, not a sacrifice, is important. This has changed my approach to my finances completely. 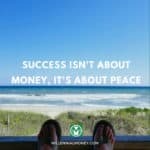 I no longer feel deprived when I see money funnelling out of my chequing account and into my investment accounts every month, it now makes me feel privileged and safe. Thanks Kate. Yeah, and once your money starts growing it’s like – wait, what, how did that happen? How do I have $10,000 already? Aw yeah! We were fortunate to be able to increase our income as well as slash expenses. Although we live lean compared to your average person, we’re still incredibly spoiled. Our savings rate is just above 50% right now. It’s an awesome feeling! 50% is incredible. You practically employ yourself! Thanks Mrs Picky Pincher. I’m saving roughly 45% of my pre tax income. I’m able to build some nice wealth, but need to stay consistent! 45% is awesome. You definitely have a savings mindset. 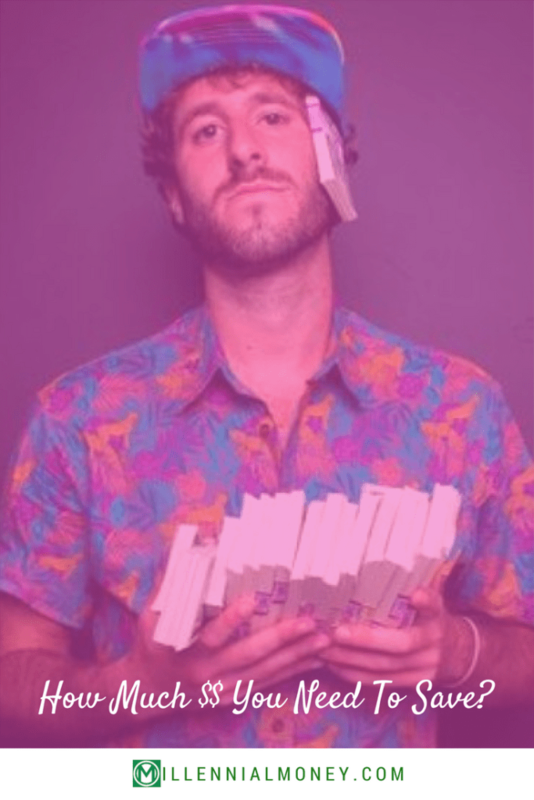 I am hoping to get Lil Dicky on the podcast – I am getting closer! Stay tuned. Thanks Erik. Thanks Michelle. I hear a lot of excuses, but anyone can start saving small. I started at $5 a day. Great post! Love thinking about saving small amounts EACH DAY instead of monthly becomes more of a game =). 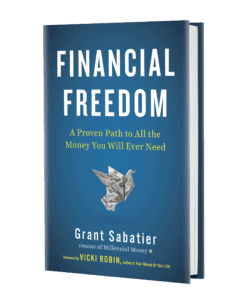 Seems like financial freedom continues to be a simple concept….Earn more and spend less. A lot can be learned from people like Warren Buffet. Thanks SC. Warren Buffet is my spirit animal. This is such an excellent read! I shared it with a few people I know that make excuses for saving. I cannot fathom going to work and not saving. It seems counterintuitive if you ask me. Thanks for sharing! Thanks for sharing it Graham. Exactly. spot on post! I just got a 60% increase in salary (new job) yet continuing to live like I did previously. All that new extra cash is continuing to go to my Roth IRA and then the rest to my brokerage account for further investing.. It takes some time, but once you do some simple calculations, you see the difference starting to save can really have. Plus, I get pumped when I can contribute to my savings and seeing the money make money. Keep up the great posts, love the info you are giving! Thanks Todd. Great decision to keep your current lifestyle! Hey Grant, this is the 2nd article of yours I’ve read, the first being “Save $50 a day article”. Here’s my thoughts, and I’m curious what you think. I love the idea of saving money, I always have yet I’ve never been very good at it. That has recently changed and I’ve made the mental change that you talk about. I’m currently just saving my money into my personal savings account having not made up my mind what to do with it. I want to invest, but honestly I have a semi long term goal of finding a way to build income so I can eventually quit my job. I just hate what I do, I make decent money, but dread every day. Therefore I may use the money I’m saving to start a small time business etc (think youtube channel, podcast, twitch stream etc) and see if I can’t turn that into a revenue stream. So my question to you, if I was to decide to save/invest this money instead, what is the most aggressive way to build that money? I’d love to not be a slave to a random weekly 40 hour schedule. I used to think any money I had left in my account was fair game to spend. I would worry about saving in my 40’s and 50’s. Cutting back (your #1) is the BEST way you can save. Obviously not eating out or going to the bar one night a week makes a big difference, but then put that money away in a different savings account or a brokerage account helps. If the extra money isn’t in your checking account you won’t use it, but you’ll feel secure knowing you have money in a separate account. That was my biggest thing. Congrats on all the savings! The only thing I’d add, is also HUSTLE to earn some extra money for saving. Everything helps. It’s amazing how simple it really is to save money. Everyone can understand it, but what separates those who do it and those who don’t is the behavior of it. So many people aren’t willing to change habits or say no to the car loans and over the top expenses you talked about cutting. Gotta change the things that bring you fulfillment to be the things that bring you money! Good stuff Grant. Thanks! Habits definitely are the key. I came across your site while reading The Post. Im hooked, and you’ve gotten this 26yo out of park and into gear. I love the blog and podcasts. Thanks for starting this site. Nice! Thanks for reading and listening Shaegan. I think it’s even MORE imperative to save and invest when you are young, than when you are older. The reason for this is the time value of money, which I write about on our blog. Now that I am 41, my wife and I are incredibly glad we invested so much earlier on. Now we can retire early and enjoy our time. I hope to retire very soon and can’t wait to be done with the corporate world. My advice is do whatever you can to be frugal and invest more money early on. Your older self will thank your younger self. Thanks for all the advice. I see some people saying they are saving 45% of their PRE tax income. In your opinion, what would be a the equivalent savings rate if you are in the highest tax bracket and live in CA which adds another 12-13% on top of the Fed rate? Obviously 45% is close to impossible no matter how frugal you are considering close to half is going to Uncle Sam. Thanks for any tips!